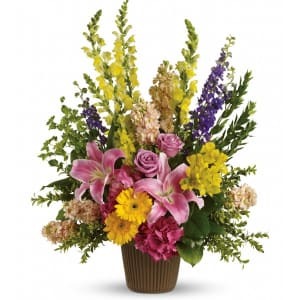 This bold and graceful bouquet of pink, purple, and yellow blooms is a caring way to share your thoughts of sympathy. 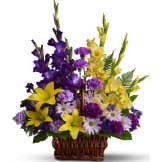 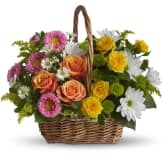 • This arrangement includes pink hydrangea, lavender roses, pink oriental lilies, yellow gerberas, yellow alstroemeria, yellow snapdragons, purple larkspur, peach stock, and accented with assorted greenery. 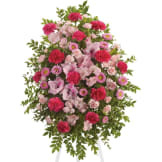 • Can be delivered to the funeral service or directly to the family residence. • Arrangement measures approximately 25" W X 31" H.